muscle cells, some with abnormalities such as double nuclei. Children with progeria, a rare disorder that causes premature aging, die in their teens of ailments that are common in octogenarians, for example heart failure and stroke. Kan Cao, a University of Maryland assistant professor of cell biology and molecular genetics, urgently wants to help find a cure. Cao and her colleagues now say they have taken a big step in that direction, showing that a toxic protein destroys muscle cells inside the patients' arteries. The researchers suspect the damaged arteries are thus primed for failure. The researchers conducted their experiments on smooth muscle cells that they genetically engineered. "This gives us a very good model for testing drugs to treat progeria. And it may help us understand how cardiovascular disease develops in people aging normally." said Cao, senior author of a research article published in the May 19, 2014 online Early Edition of the Proceedings of the National Academy of Sciences. Progeria is extremely rare - about 100 patients worldwide have been diagnosed - and always fatal at an early age. Patients typically die around age 13. The disorder is difficult to study because patients are so few, and their rapid decline mostly affects internal organs. That makes the effects hard to track without invasive testing, from which researchers want to spare the young patients. Until now, researchers didn't know what mechanisms might be causing the patients' deaths. They knew a genetic mutation makes patients' cells produce progerin, a toxic form of a protein that, in healthy people, forms the skeletal structure of cell nuclei. In previous studies Cao and others found that progerin builds up in cells of elderly people, suggesting that it is also linked to normal aging. But progerin's effects on smooth muscle cells were unknown before this study. Studies in mice with a genetically engineered form of progeria found the animals lost most of the smooth muscle cells in their large arteries. This muscle type, involved in involuntary movement, is in the lining of many internal organs, including blood vessels. 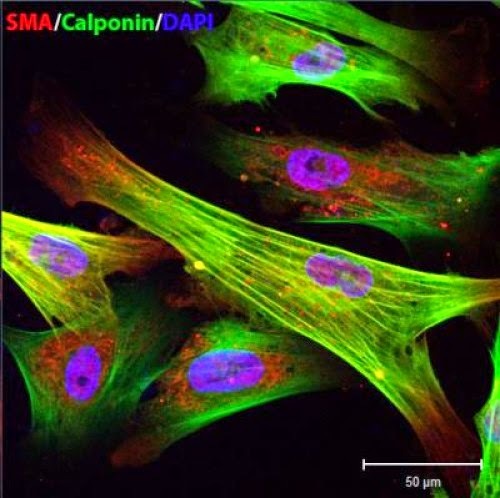 Cao's team couldn't obtain human smooth muscle cells from progeria patients for their study because the process would be too invasive, so they used induced pluripotent stem cells. In a first for a progeria study, the researchers induced skin cells from progeria patients and normal adults to develop into smooth muscle cells, and then compared cell reproduction and decay in healthy cells with those same processes in cells containing the progeria mutation. Both sets of smooth muscle cells began multiplying, but after two weeks the progeria cells leveled off; as many cells were dying as were reproducing. The researchers discovered that the progeria cells accumulated toxic progerin and had abnormally low levels of PARP-1, a protein that is important in repairing cell damage. Cells constantly repair damage to their DNA, Cao explained, and they have several ways to get the job done. When one strand in the DNA double helix breaks, cells usually use the unbroken strand as a template to make a perfect copy. PARP-1 is supposed to sense the break and start this repair process. In the study's normal smooth muscle cells, that's what happened. But sometimes a cell simply splices two broken DNA strands together end to end. If the right two strands reconnect, the cells resume normal reproduction, splitting to form two new daughter cells in the process called mitosis. But if the repair isn't right, those cells can't successfully split. In this study, the smooth muscle cells created from progeria patient skin cells, with high levels of progerin and low levels of PARP-1, did not use the more accurate repair method. Instead, they spliced together segments of DNA that happened to be nearby -- and usually got the sequence wrong. After the faulty repairs, these cells could not split their contents evenly during mitosis. Some cells kept trying to divide and eventually died trying, in a phenomenon called "mitotic catastrophe." Others failed to divide and ended up as one cell with two nuclei. Researchers think that after losing so much smooth muscle tissues, the arteries are easily damaged by mechanical stresses such as blood pressure, making them vulnerable to failure in the form of coronary artery disease or strokes. They'll test that in the next phase of their research, and will try to determine why progeria cells do not use the best pathway for repairing DNA damage. They also plan to use the smooth muscle cells derived from human induced pluripotent stem cells to test new treatments for progeria. Cao, who has developed friendships with some progeria patients, took her research team, which includes three UMD undergraduate students, to a 2013 Progeria Research Foundation workshop where they met progeria patients. "The students began thinking, 'My research is so important for the families.' It's a lot of motivation for them. and a lot of pressure for all of us to work quickly." Cao said.